It’s always good to hear Mats Edén play solo or accompanied, even when the accompaniment is by… Mats Edén. Past projects by Edén have shown great application of himself in a variety of natures and directions: e.g., the microtonal harmonies of Milvus, the complex arrangements and improvisational work of Groupa and Crane Dance Trio, and the more tribal-natured percussion accompaniment by Tina Quartey on Vägen In. 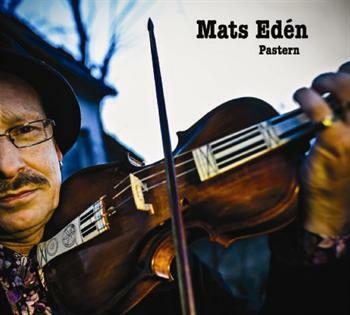 Pastern may be Edén’s most fiddle/hardingfele-bound album since Struling in 1993, and is devoid of extrinsic influence. This release is more of an exhibition of his fiddle playing and interpretation style in a traditional context, and though it is not unsentimental, it has a consistently strong energy about it. Almost half of the tunes on this recording are Edén’s compositions, and the rest of the tunes are quite diverse in their origins and styles, and include a couple tunes from Hjort Anders of Bingsjö, played in the old style, where the melody is masked in a flow of mordents and other articulations. That being said, Pastern is an album that should be welcomed by not only the traditional dance community, but also by any who wish to be able to sit down and examine the sounds brought forth by a profound fiddle player of Scandinavian origins. Of all the work, “Alvleken” stands out as a wonderful composition by Edén. It is also refreshing to hear his take on a rarer tunes like, “Per Andsu Lietjin,” and tunes with more elusive melodies, like Hjort Anders Olsson’s brudmarsch.